Since Winnie has been around for quite a while, (Did you know he was inspired by a REAL bear from the early 1900’s?! ), his look has changed a bit through the years. 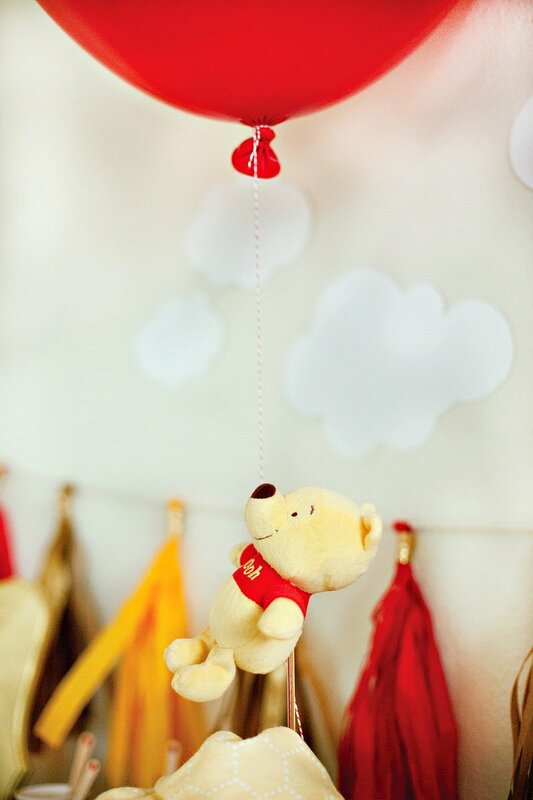 The current day Winnie sports a bright red t-shirt and modern look, while “Classic Pooh” has softer colors and a more vintage vibe. 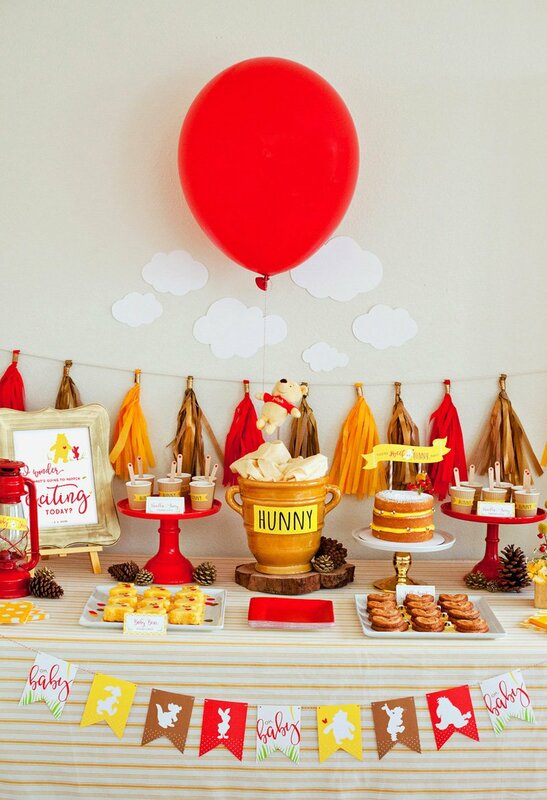 I really love the look of the both styles, as well as the woodsy feel of the famous “100 Acre Wood”, so my goal was to design a baby shower that encompassed all of these different elements in some way. 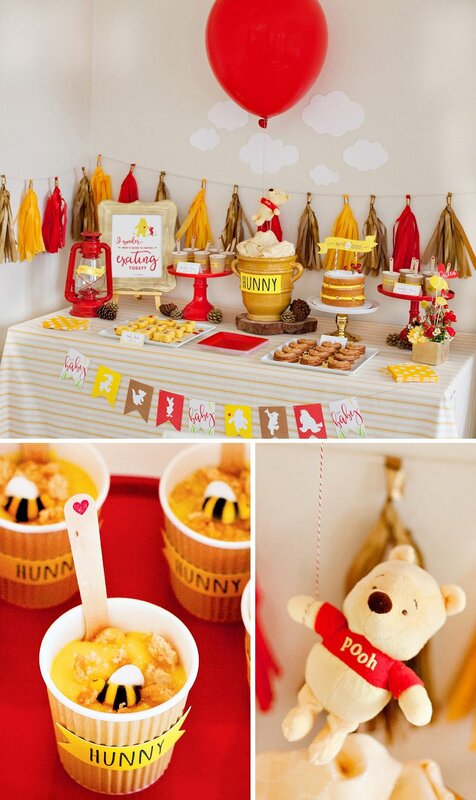 You’ll find lots of fun DIY ideas below, from painted-bath-toys-turned-table-figurines to “HUNNY Pot” parfaits with sugar bees and a playful Winnie the Pooh Diaper Cake. 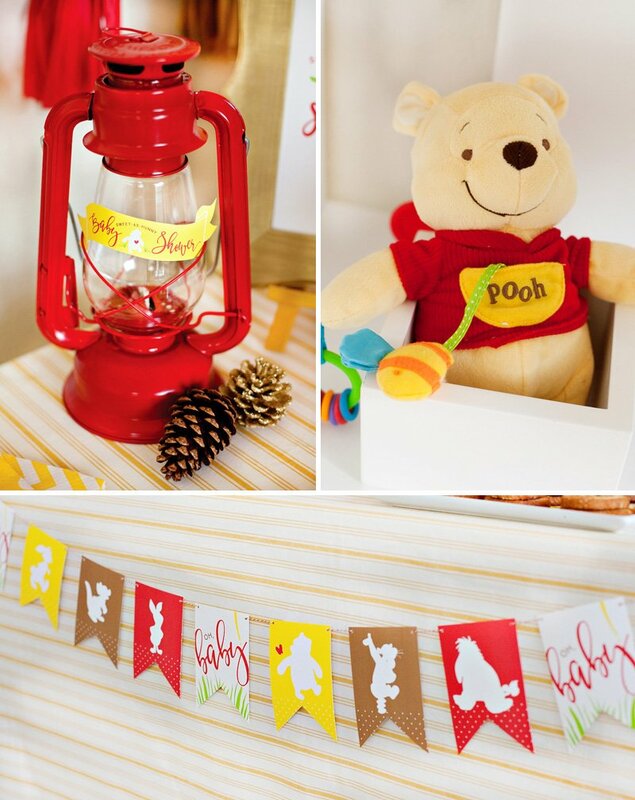 I also incorporated some sweet Winnie the Pooh toys & nursery items from DisneyBaby.com into the decor, which is one of my favorite ways to play up any theme at a baby shower because the items double as thoughtful gifts for mom when the party is over! There’s a lot to take in here, so I’m breaking this post into “party sections” to help keep it organized for you. And speaking of sections, don’t miss the very last one with links to download all the FREE PRINTABLES from this theme. Enjoy! P.S. 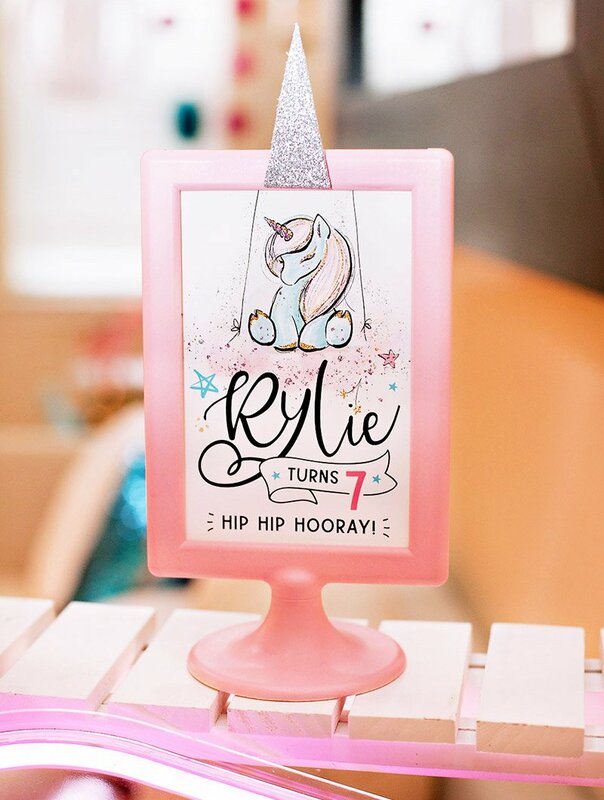 The free printables are available in a pink/yellow colorway now too! 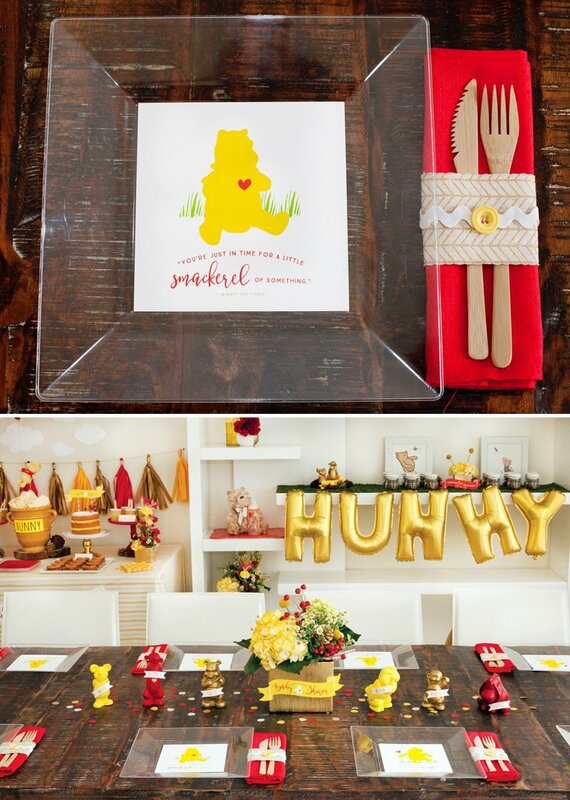 I wanted this Winnie the Pooh tablescape to feel warm and festive with a hint of gold glam. 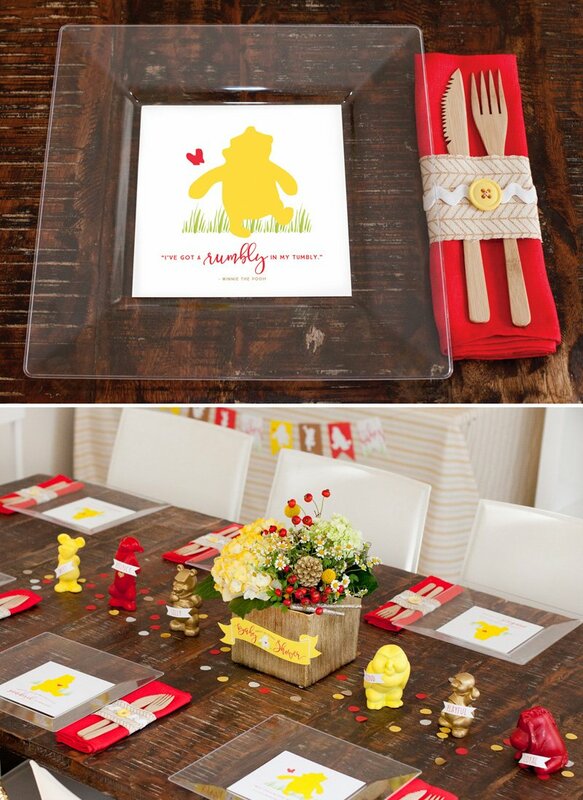 The DIY plate liners feature playful Pooh quotes like “There’s a rumbly in my tumbly.“, and you can place them on top, menu-style, or use this method to securely attach them to the underside of clear plastic plates. If you’re wondering about the little character “figurines” positioned down the center of the table… those are actually silicone bath toys! 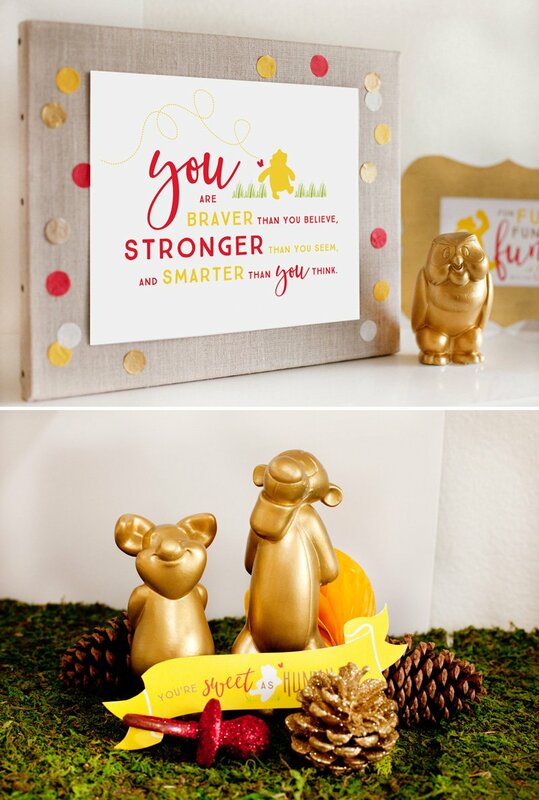 I painted them and added little paper word banners that felt appropriate for each character like BOUNCY for Tigger and SILLY for Pooh. HELPFUL TIP: There were big lessons learned during the process of making these figurines… spray paint is usually my go-to for this kind of thing, but it just DID NOT DRY, even after waiting for 24 hours or prepping the toys with spray primer first. After a lot of messy fingers & trial and error, I figured out that the ideal method for painting these toys is to first wash and dry each one thoroughly, then apply 2 coats of white acrylic paint as your base coat, then apply the color of your choice on top. (You can use spray paint or acrylic paint for the last step.) It took some figuring out, but I love how they turned out in the end! It’s always thoughtful to decorate a special chair for the guest of honor. 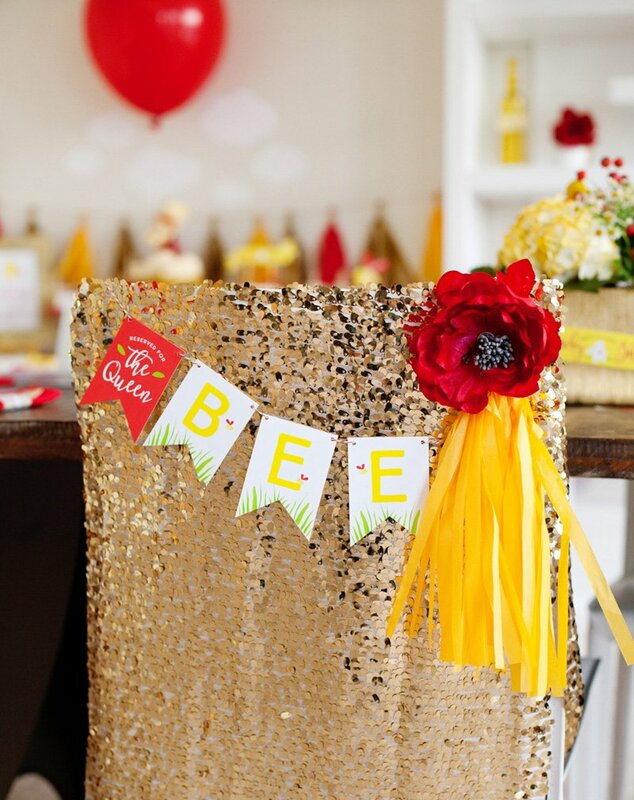 I used gold sequin fabric that I found at JoAnn to cover this chair (but you can also rent sequin chair covers similar to this), and designed a printable banner “Reserved for the Queen BEE” banner to hang on the back. I also printed & cut out some cloud silhouettes to attach to the wall behind the balloon. 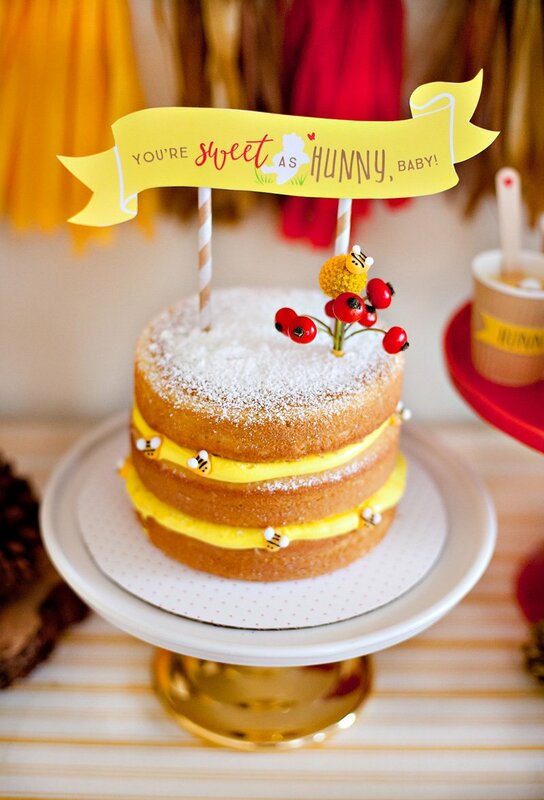 Here’s a cute idea for a cake if you want to go the homemade route: a simple “naked” layer cake with yellow frosting & Icing Bumblebees between each layer + powdered sugar dusted on top! 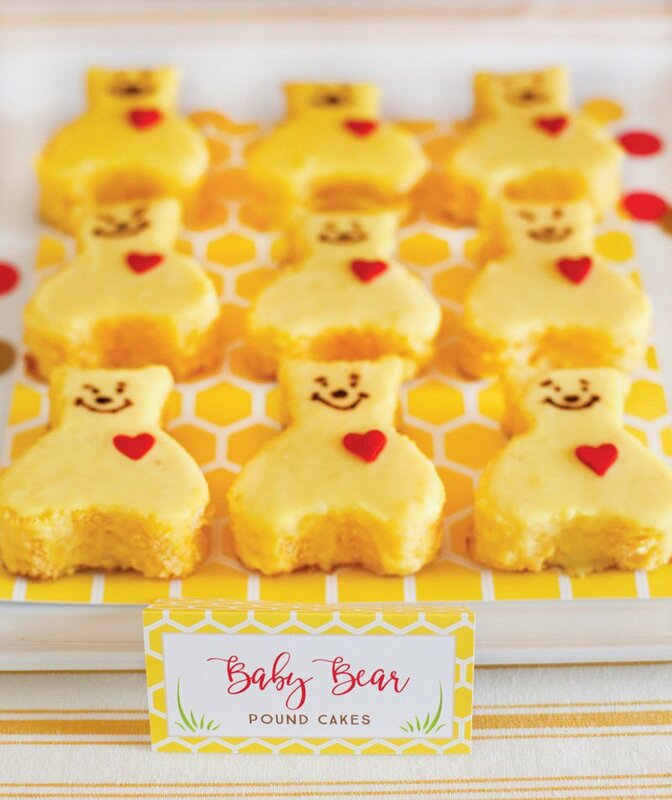 These “Baby Bear Pound Cakes” were made from store-bought pound cake. I used a bear cookie cutter to cut them into slices then poured on a yellow glaze and added an edible heart sprinkle. Once dry, I used an edible food writer pen to hand draw the faces. Vanilla and Honey Pudding Parfaits are super easy and equally cute. :) Just layer crushed vanilla sandwich cookies with vanilla pudding. 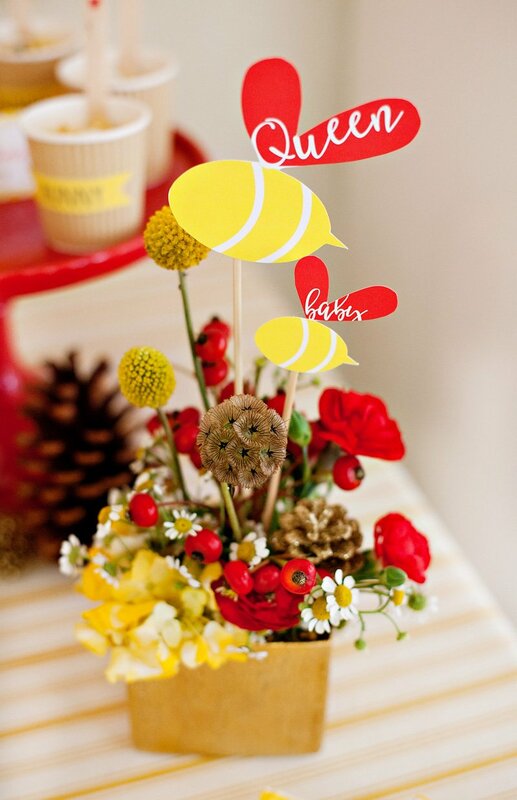 For the garnish, sprinkle on more crushed cookies then add a drizzle of honey and a sugar bee! 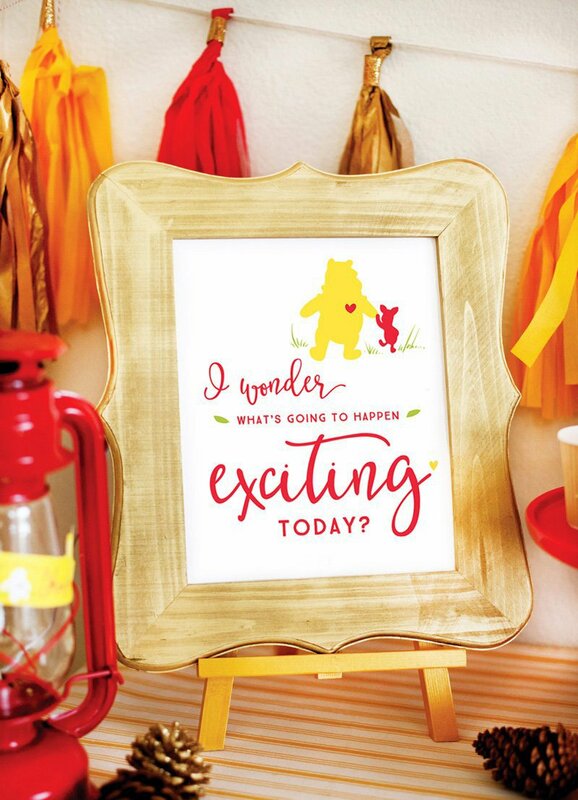 I always love using framed quotes as decor, and Winnie the Pooh has some great ones! The quotes featured in these images are all available to download in the Free Printables section below. 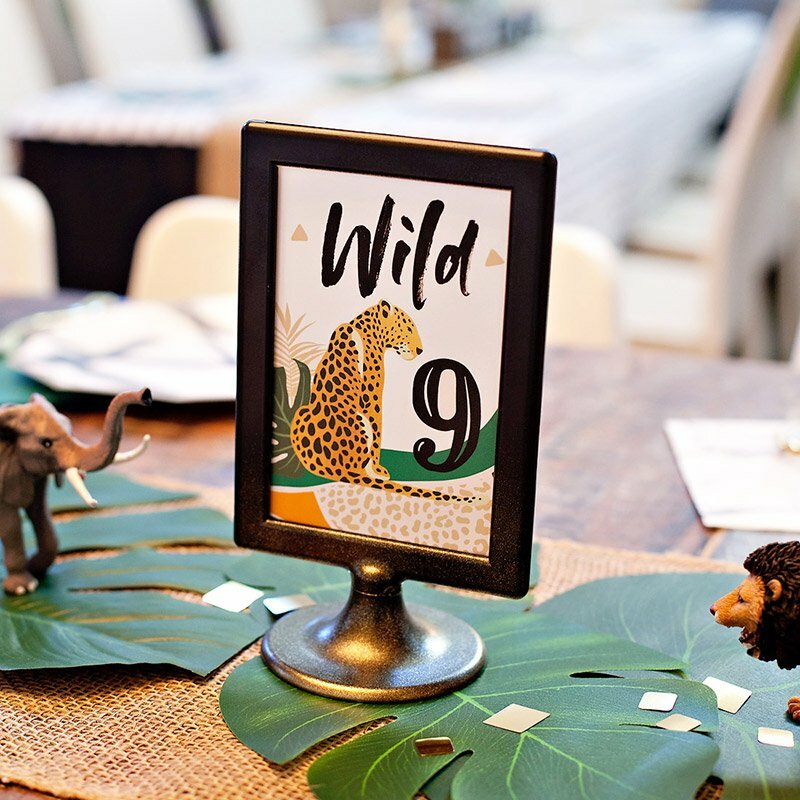 I also used woodsy elements like pinecones (both natural and glittered), moss, and wood slices as accent decor, in addition to festive “party” elements like tissue confetti and 16″ gold letter balloons. This red oil lantern made for a great dessert table accent (and was less than $9! ), and a Winnie the Pooh Activity Toy added another nice pop of color near the favor station. The “cake” is made from 10″ and 12″ circular paper mache boxes that are filled with diapers and stacked. 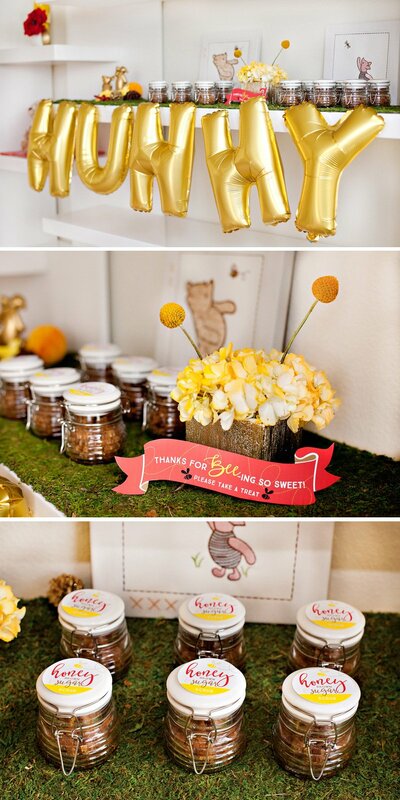 I spray painted just the outside of the boxes gold before filling them with diapers, and hot glued a printable HUNNY sign and some Icing Bumblebees to the front. 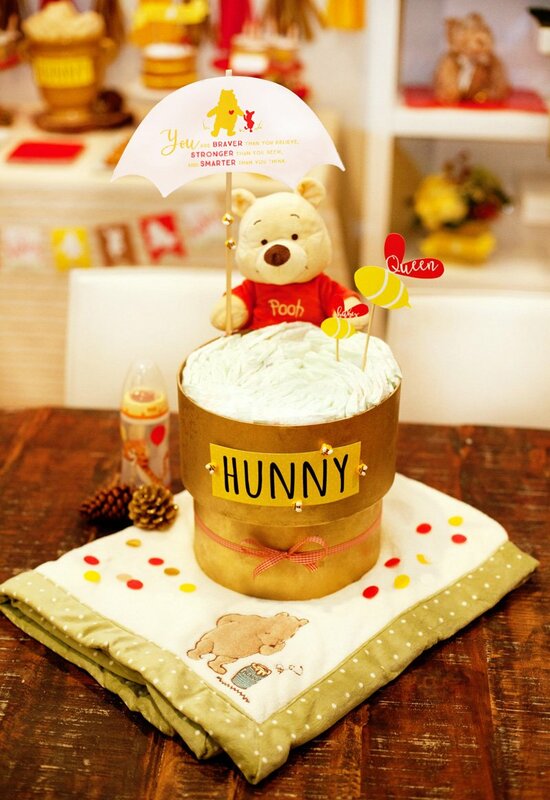 The 9″ Winnie the Pooh Plush that’s “peeking into the honey pot” is actually sitting on top of a glass mason jar positioned behind the cake. I used baker’s twine to attach his arms to wooden dowels that are inserted into the back of the diapers. This makes it look like he’s actually he’s “grabbing on” to the pot. Homemade Honey Brown Sugar Scrub makes a perfect favor for this theme! It’s cost-effective and you only need a few ingredients to whip up a batch. 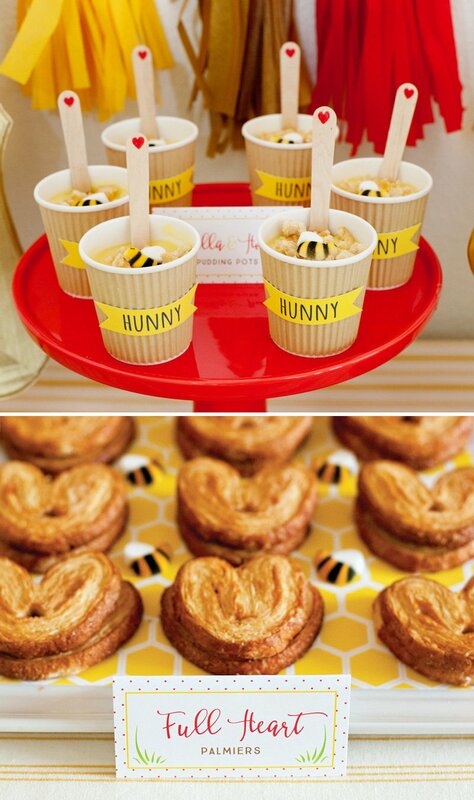 I found cute Beehive Jars to package them in and used glue dots to attach a printable favor tag to the top of the lid. 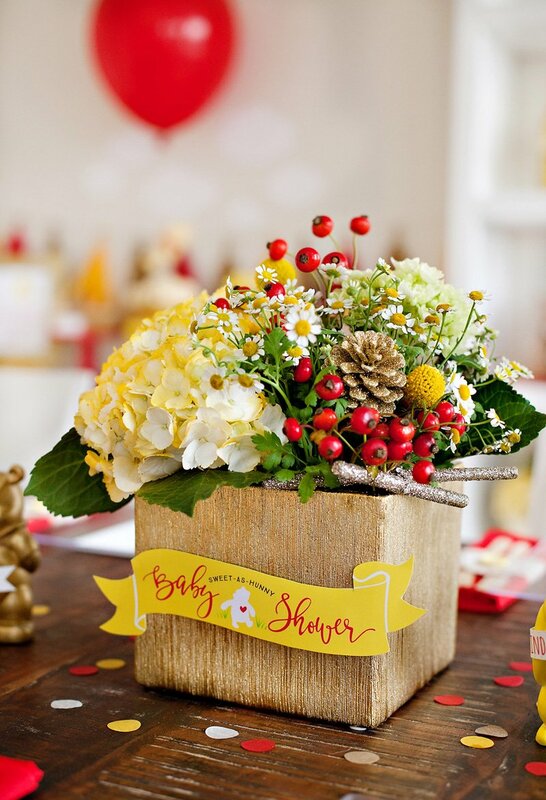 To make the presentation as cute as the favors, display them on top of woodsy moss with yellow flowers and other themed accents around, like this My Friend Pooh Wall Art that can adorn the nursery or playroom walls after the baby shower. 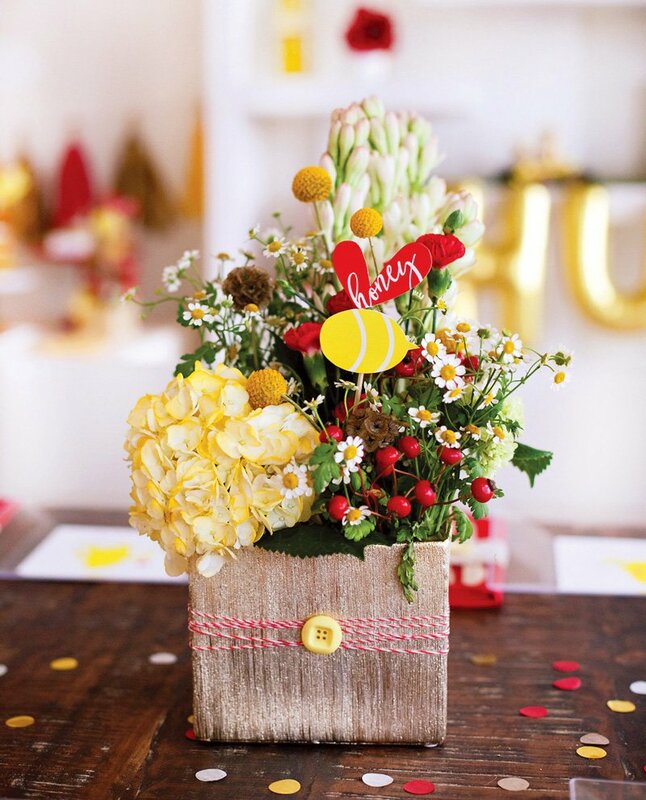 Paper details really help tie everything together at a party! 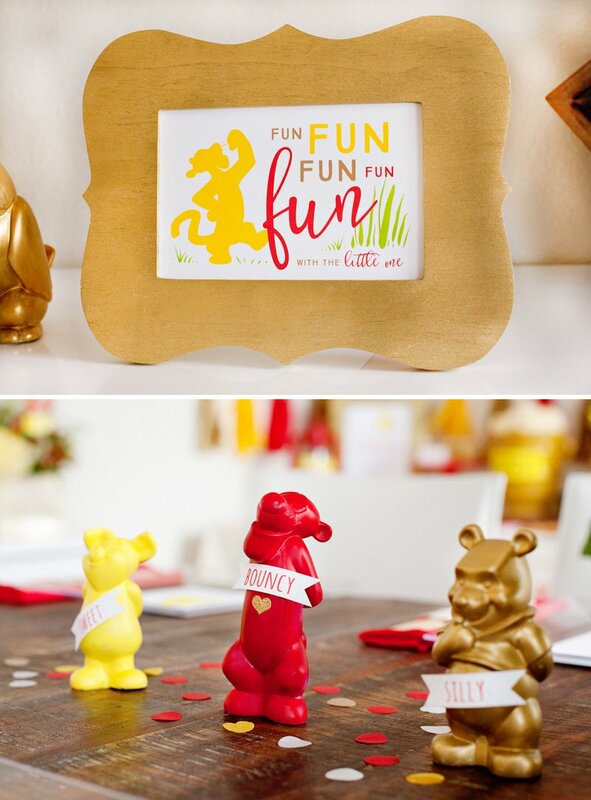 I hope you’re able to have some fun with these Winnie the Pooh Printables. Just click on a link below to download the high res PDF. And for the PINK/YELLOW version of these, click here. Disclosure: This is a Sponsored Post for Disney Baby. As always, all thoughts, opinions, and designs are my own. Thank you so much for supporting the sponsors that make it possible for us to keep the creative content coming your way! 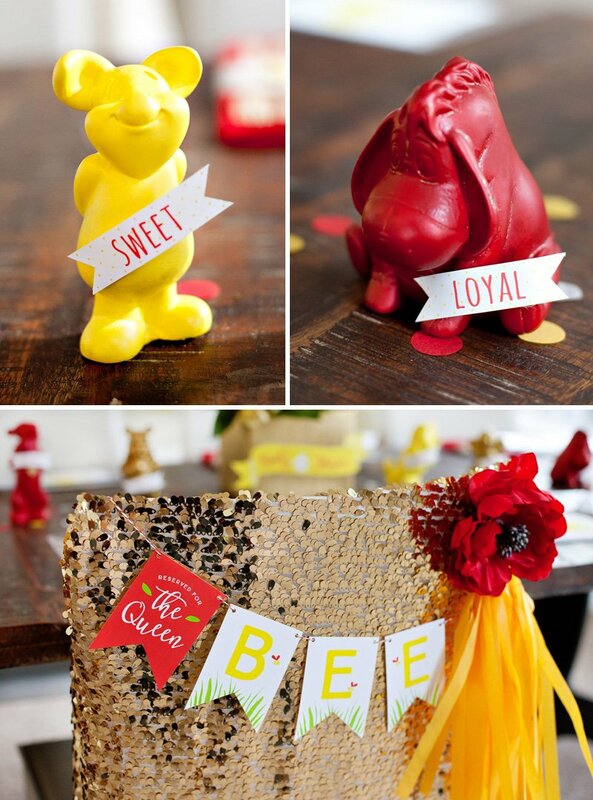 It’s about time the Pooh receive special attention in the blog and have an exclusive publishing for it! How did you make the cute gold box or is there a place to get these? :) Amazing post!!! Thanks, AJ! I think you’re referring to the gold cube vase used for the table centerpiece? If so you can find it right here: – or if you google search “etched cube vase”, you should be able to find similar products at other places too. :) Hope that helps! 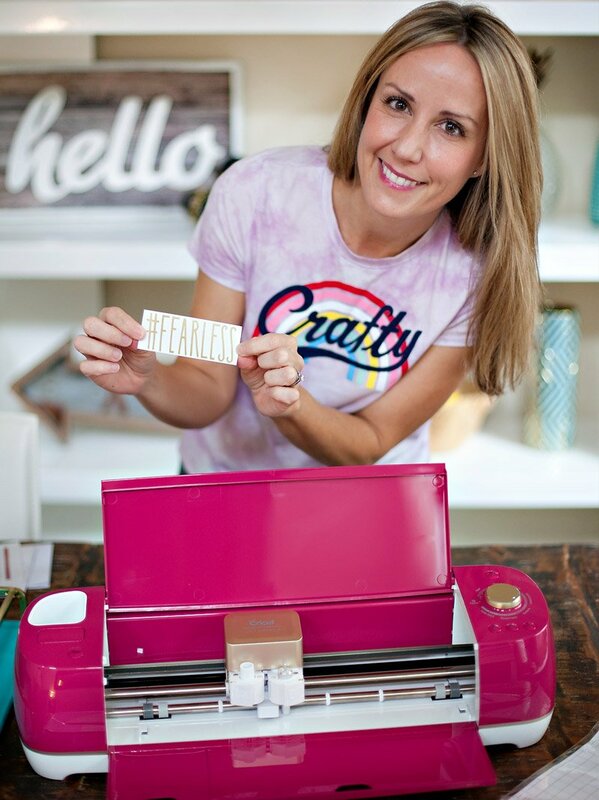 Did you design all of the printables? 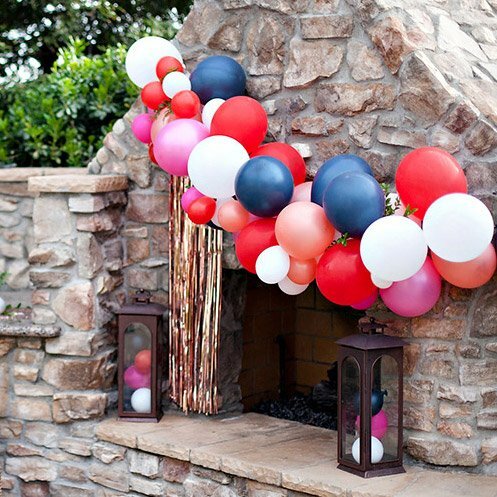 I would love to be able to customize some of them to fit a 1st birthday party. Would you be interested in discussing pricing to customize a few of them ? Thank you! I absolutely adore this. 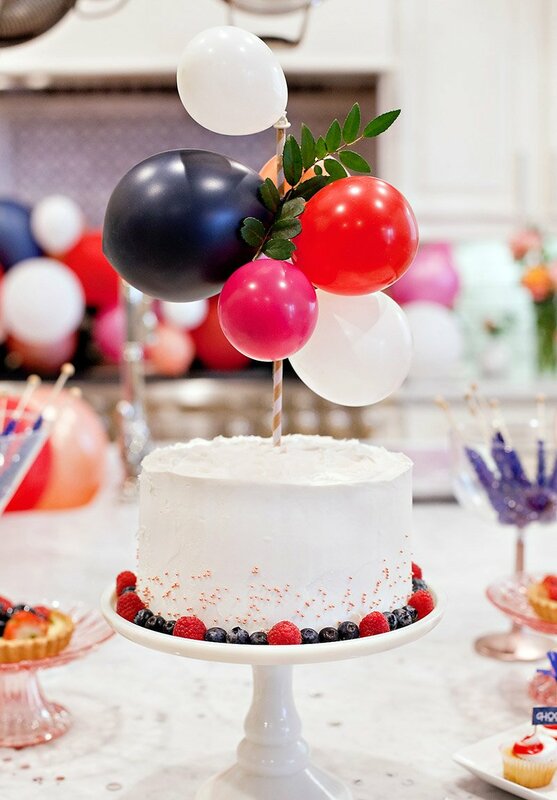 What colors were used when picking the confetti and garland? Thanks, Jennifer! I used the tissue tassel garland kits and confetti from The Flair Exchange, and the colors were Metallic Gold, Red, and Golden for the tassels, and the “Golden” Confetti Mix + Red and Golden Yellow for the confetti. I love this! Do you have any invitations or thanks u cards that go with this? Are these printable need special paper ? Or special printer ? Or just regular computer paper is fine ? Wow! This is all SO beautiful! I would love to use these downloads for my sisters baby shower….I’m trying to figure out how I can replace all the red lettering with pale pink though for her little girl. Since everything is set in place I’m having a hard time dong that? Any ideas? 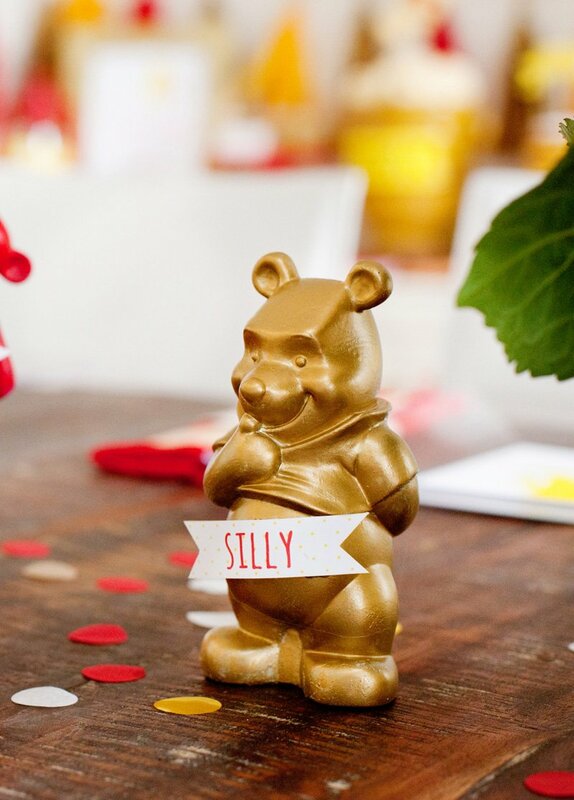 I like the modern classic Pooh theme. The color scheme looks really good. The cake is so adorable! I’m trying to add my food labels to the blank tent cards, but can’t seem to find the right fonts! Are you able to share which fonts were used so I can keep the look consistent? Love the designs! 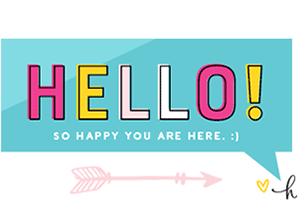 Hi Courtney – The fonts that I used on the original tent cards were Betterfly Smooth (the scripty font) and True North Regular (the san serif font). I purchased them both on Creative Market. Hope that helps! Hi! Can you please tell me where you got the table cloth? So cute! Love everything you did here. Thanks for the kind words! The “tablecloth” is actually a curtain that I picked up at Ikea. ;) I often use patterned sheets, duvets, fabric shower curtains, and panel curtains as “tablecloths” for dessert tables because they’re so much less expensive and offer way more patterns than standard linens. I bought this particular curtain quite a while back though (probably 6 or 7 years) so they may not carry it anymore – but they always have a pretty good selection that rotates through. Target is my other go-to for this type of “linen”. Good luck! Thank you so much, Jenn. Really appreciate the response and that is so clever! I’m going to take a look now:) Thank you again. Love your blog. This post really inspired me.